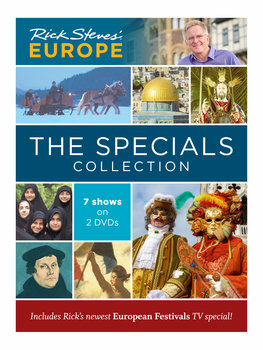 100 percent special: In this new two-DVD set, Rick breaks out of the limitations of half-hour TV episodes to give you more depth and breadth on special topics, including Europe's most exciting festivals, Martin Luther and the Reformation, Iran, the Holy Land, Christmas and Easter in Europe, and a "symphonic journey" through European anthems. And as a bonus extra, we've included outtakes and bloopers from nine seasons of Rick Steves' Europe TV episodes! What's new: If you already own Rick's "Complete Collection 2000–2016" DVD Box Set, much of this content is repeated — except for the "European Festivals" special and some new bloopers.